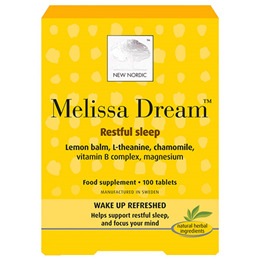 The Melissa Dream is the tablet you need to maintain a normal restful sleep, normal functioning of your nervous system and the ability to deal effectively with impulses which affect the focus of your mind. The unique bioactive micronutrients and herbal extract combination contained in each tablet nourish and influence your brain, nerves and your psychological unctions. The tablet, which is manufactured in Sweden contains a lemon balm extract, which helps maintain a restful sleep, L-theanine amino acid, chamomile extract, vitamin B complex and magnesium. The content of B vitamins contributes to normal psychological and nervous system function. Filler (microcrystalline cellulose), Lemon balm leaf (Melissa officinalis L.), mineral (magnesium oxide), camomile flower extract (Matricaria chamomilla L.), L-theanine, disintegrator (crosslinked sodium carboxymethyl cellulose), coating agents (magnesium salts of fatty acids, hydroxypropylmethyl cellulose), vitamins (nikotinamide, pyridoxinehydrochloride, riboflavin, thiaminemononitrate, yanocobalamin) anti caking agent (silicon dioxide). Take two tablets one hour before bedtime. 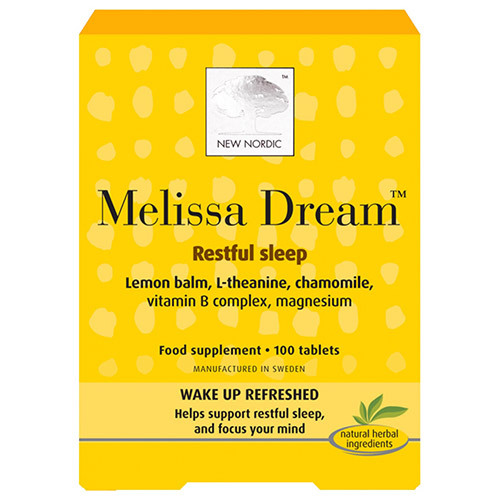 Below are reviews of New Nordic Melissa Dream - 100 Tablets by bodykind customers. If you have tried this product we'd love to hear what you think so please leave a review.